Today's Tribune reports that Chief memorabilia and products are "flying off the shelf" in response to the recent announcement of the last half-time performance by our school's racist mascot, Chief Illiniwek. At CRCE yesterday (one of the campus gyms) I noticed more chief T-shirts than usual. There have been two fellows who dress up as the chief, okay one as the Chief, and the other as the "assistant chief," which I agree with Z is very funny in part because it overlays the U's preferred corporate structure onto what is supposed to be a 'native tradition.' [John REALLY wants the asst. chief to be called "assistant TO the chief," a la the british version of The Office.] In any event the two guys tried unsuccessfully to obtain a restraining order against the University to prevent it from retiring the chief. I'm a little confused about how that would work anyway--don't restraining orders usually establish a set distance that the 'restrained' must keep from the person who is granted the r.o.? How would that work with a campus? 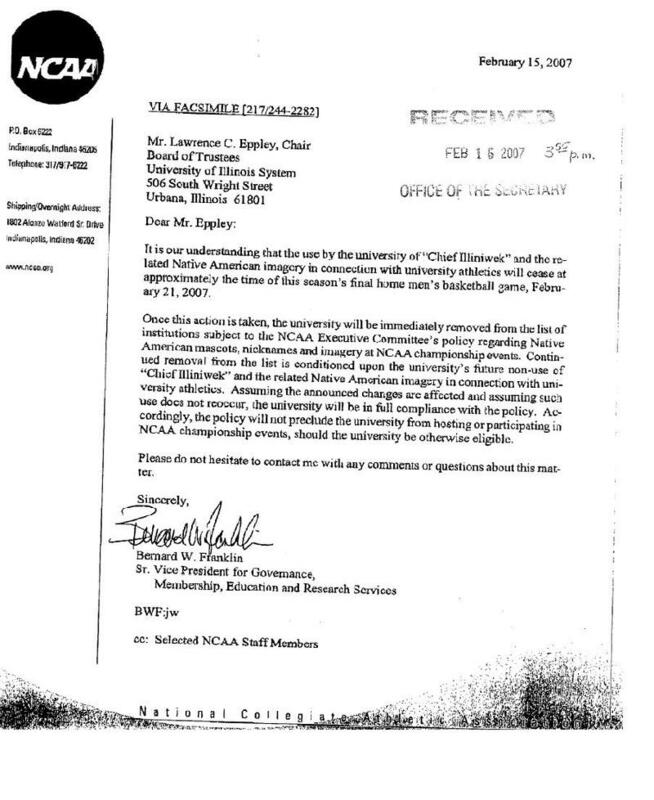 I'm also interested in the rather vague section of the NCAA's fax (below) to the Chair of the BOT that claims the use of "related Native American imagery" will cease. (Thanks to Z for pointing this out in the comments of my previous post.) I've noticed that the most common T-shirts on campus simply have the word CHIEF (all caps), no images. I do wonder, practically, how all the image limitation is going to work. I guess it means the U can no longer profit from the licensing. Perhaps these questions are unanswerable precisely because the NCAA's legislative powers are so limited. I will admit I'm a little uneasy about what will happen on Wednesday night at--or after--the final performance. Does anyone know if campus is going to increase security measures at the arena and on campus?